Preheat oven to 375. Get Sauté pan hot and add olive oil, Sear chicken until half cooked adding our Italian seasoning to taste. Place seared chicken in baking dish. Combine Preserves and orange juice, evenly pour over chicken cover and bake 30 minutes or until chicken is done. Serve hot and ladle extra preserves over top of chicken. Hi, I popped over from Women Living Well and I have to concur with Our Delightful Home - Yummy! I'm going to give this a try with my chicken-loving grandchild. :) Thanks. I am so going to try this. We love chicken and I need new recipes. I just love the addition of the Apricot preserves with the Orange Juice in this great recipe! This looks pretty good! Thanks for linking up at Foodie Friday! 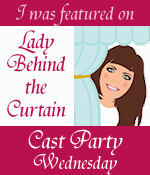 Thank You for sharing your recipe with us at Cast Party Wednesday ! I have apricot preserves wasting away in my refrigerator, so glad to find a use for them. When orange and apricot come together in a recipe, the results are delicious! What a great recipe! Thanks for adding your wonderful post to this week's linky party at Foodie Friday. This looks delish! Can you please share at my Taste This Thursday party! Your newest Follower! Sounds delicious! Pinning it. I think this will be on tomorrow nights menu!